With every major construction industry represented amongst 2,500 exhibitors across 2.5 million square feet, CONEXPO-CON/AGG represents an opportunity to make waves, and deals, across the industry and expand your business. To make the most of the CONEXPO-CO/AGG, planning is paramount. There is a lot more to tradeshow preparation than putting up an eye-catching booth (although that is very important). There are steps you can take now to improve your chances of making CONEXPO-CON/AGG a big success. Here are 8 tips from the experts at 2020 Exhibits. CONEXPO-CON/AGG rolls around once every three years. Your strategy three years ago may have changed since the last show. Are you looking to grow business or identify new vendors? Do you have any new products you want to introduce to the marketplace? There’s limited and time and space on the showroom floor, so it’s important to find out where you want to focus your efforts. The attendee list at CONEXPO-CON/AGG is broad. All kinds of contractors, materials suppliers, and manufacturers are in attendance. It’s important to determine who you want to target and seek them out well ahead of the show. Getting a return on your show investment is going to be a top priority. Once you’ve established objectives, determine what it will take to get there. Running the numbers ahead of the event will help you build a road map to success and that all-important ROI. Stay a step ahead of your competition by putting your message out there way ahead of the show. Whether it’s a targeted e-mail strategy, a direct mail campaign, or simply hitting the phones, setting the agenda with potential customers or contacts will pay huge dividends. Aggregates and concrete may not lend themselves to flashy exhibits, but it’s important to draw attention to your offering and differentiate yourself on the showroom floor. Contact the experts at 2020 Exhibits for everything from content creation and award-winning design to installation. It can be tough to communicate messages surrounding construction and materials in a trade show booth. A video solves that problem. Creating original video content for your product or service is an excellent investment when preparing for a tradeshow. Here are five reasons why. If you haven’t already, reach out to CONEXPO-CON/AGG prior to the show. It can only help you. There are plenty of networking opportunities within the organization. Take it a step further and ask for a speaking opportunity at the show. Leading a session will demonstrate that you are an industry thought leader and that will certainly draw interest from potential clients. 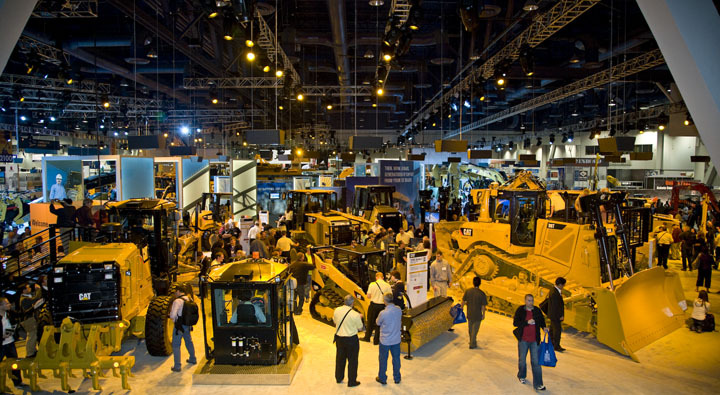 CONEXPO-CON/AGG emphasizes technology and innovation and your exhibit should do the same. Ensure that you’re showing your company as cutting edge by employing state-of-the-art A/V and engage attendees with interactive kiosks that drive lead capture technology to help bring home sales after the event.